Having read the first two books featuring DI Kim Stone already this year and loved them partly because although they are crime fiction, there is plenty within the pages that allows the reader to deduce the psychology, not just of the perpetrators of the crime but those investigating it as well as the victims and their families. In this book two young girls have been kidnapped on what should have been an ordinary day for the two friends; swimming lessons at the leisure centre and then being picked up by one of their mothers. But for Charlie and Amy the expected lift never turned up, instead they found themselves bundled into the back of a van and driven away. I must admit the scenes involving the two girls were incredibly effecting, never over-the-top but you’d have to have a heart of stone not to feel the fear that comes of the pages. Kim Stone is the Investigating Officer requested by Karen Timmins, Charlie’s mother, who grew up with Kim although they were far from friends. Kim quickly assembles her team, old favourites from the previous books, and after visiting the parents they sets up a ‘war room.’ If you’ve read the previous books it is clear that not solving the case and bringing the girls home safely is simply not an option for Kim Stone so she starts combing the background of the parent’s lives for clues as well as trying to find a connection to a similar kidnapping eighteen months previously. In that instance, one of the girls returned home, the other was never seen again. And then the text messages start! In a horrific twist on the ransom demand expected, the two sets of parents are asked to enter into a bidding war for their daughter’s lives. The negotiator seconded to the team for the duration, Matt Ward, has a problem on his hands as it seems like the kidnapper’s motive isn’t just the money! For a female crime writer, Angela Marsons doesn’t shy away from the worst kinds of crimes, and the worst kinds of criminals and her chief protagonist Kim Stone isn’t someone that you would want to be on the wrong side of, that’s for sure. But for all of that, these books give far more than that shiver of fear that you get when you know that this is just a story that you’re reading while safely tucked up in your secure house. In fact there is plenty to observe as the author portrays the relationships between all her characters perfectly with so much showing, rather than telling, that in some ways it feels like you are watching an exceptionally good drama on TV.Realistically the workload always makes mention of other parts of the caseload that comprises her role as DI in the Black Country, in this instance the death of a young gang member and a certain reporter that Kim is determined to keep in her place. This book conforms to all the clichés, there is palpable tension from the start and it doesn’t really ease up at any point, so there is no sitting comfortably and enjoying a relaxing read, your heart will race, you’ll be on the edge of your seat and those pages simply won’t turn fast enough. I’d like to say a huge thank you to Bookouture for allowing me to read a copy of this book in return for my honest review. 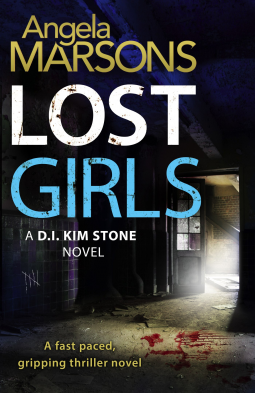 Lost Girls is published tomorrow, 6 November 2015 and even though I’d suggest reading the whole series I think that this would read perfectly well as a stand-alone novel. I love crime fiction that shows us the lives of the detectives involved in the cases, as well as the victims and their families. This one sounds good. It is incredibly well written with lots to keep the reader interested. This certainly sounds compelling, Cleo. The setting and context sound effective, too. I think it’s hard to write about this sort of topic without going ‘over the topi,’ so I’m glad you don’t think that happened here. I do like the balance on these, it isn’t all swearing and action, there were lots of scenes where the reader could observe the relationship change between the sets of parents as the stakes rose – just as interesting for me than endless action, although there is plenty of that too. I’ve become a huge fan of crime fiction lately. This sounds good and I’ll add it to my list. Oh wow, this sounds fantastic! That’s great that the scenes with the girls were done well. It sounds awful, but with books like these, you want to be able to feel the emotion. This author really does know just how to keep the action and the observations of the characters in perfect balance. It was a very emotional read though. A convincing review. I added Kim Stone #1 to my TBR and yay on my library having the Kindle version. Oh excellent I do hope you enjoy it Stefanie! I read the first in this series and have second on the kindle. I did enjoy the one I read and it sounds like are getting better. I don’t know how Angela Marsons does it but this series really does just keep getting better! Makes a change from authors who rest on their laurels or repeat the same story.